Now we all know me, I dislike a few things in this lil nail polish blog-o-sphere. Those things are, simple manicures (on me only, on others they look amazing and for me I freak), water marbling, and tape manicures. After this manicure, I believe we can take tape manicures off that list. In the past, whenever I've attempted tape mani's, I would use scotch tape. Each and every single time I attempted to use scotch tape, I would rip off a could portion of the base coat, or the stupid polish would sneak under the tape. I became extremely jealous of all the other girls who could successfully do a scotch tape manicure. 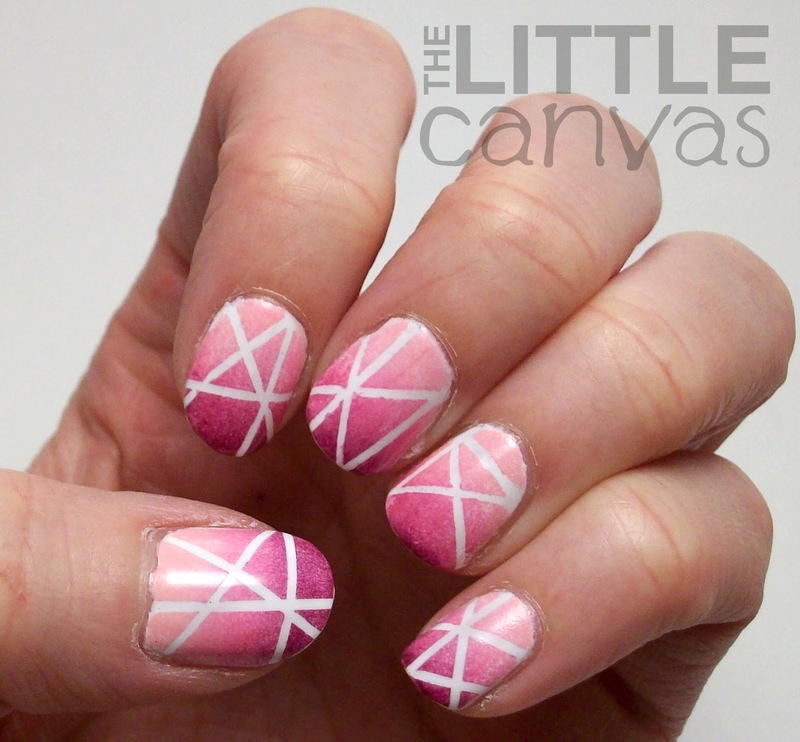 I received some nail art tape from the Born Pretty Store to review. I was iffy about it due to my past with scotch tape, but I was quick to see it was a totally different experience. And now, I am in LOVE with tape manicures!!! 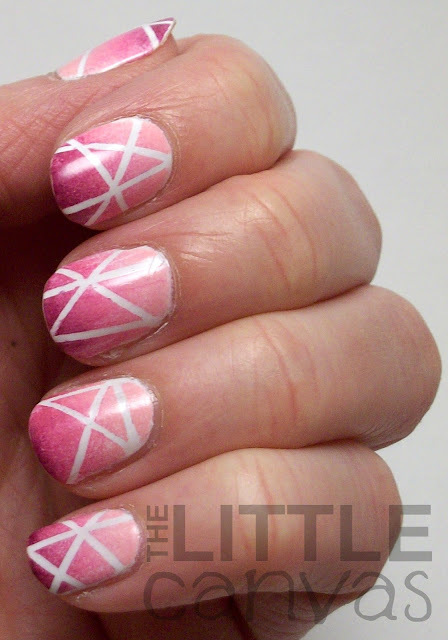 For this manicure, I was inspired by a gradient laser tape manicure I saw over at Chalkboard Nails. Instead of using the same colors Sarah used, I decided to go all pink since Valentines Day is right around the corner. Despite my hate for the holiday, I thought I would be festive, especially for you followers. Let's see what I came up with using my new tape! Love, love, love! To get this look, I started with a base coat of Ulta Snow White. I believe that this is my new favorite white polish. For this manicure, I used only white coat on the base. Typically I use 2 for full coverage, but for some reason, when I applied one coat this time I did have full coverage. Since I only used one coat, I decided to skip a layer of Out the Door and waited five minutes for the white polish to dry. 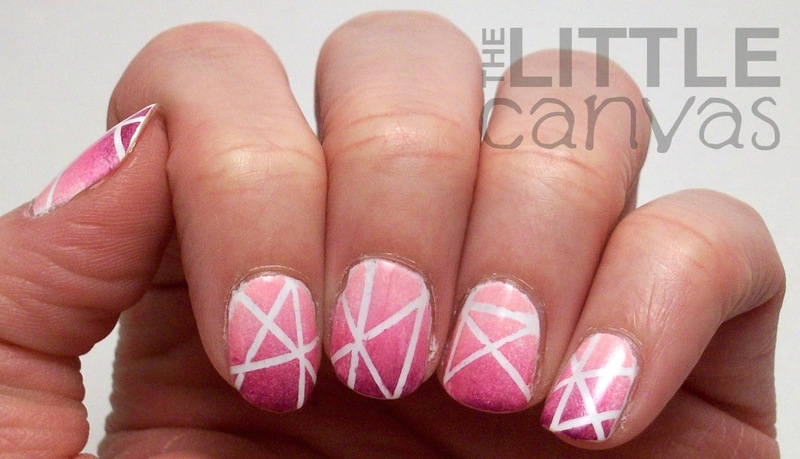 When dried, I took four pieces of nail art tape and placed them on the nail in different directions. It is easiest to do this one nail at a time. I could not imagine having tape on all my nails then attempting a gradient. Once the tape was applied, I took my make up sponge and painted my colors on and dabbed it onto a paper plate. After a few dabs, I dabbed the sponge onto my nail. When the gradient had completely covered the nail, I quickly removed the tape. I waited a few seconds, then added some Out the Door. Bing, bang, boom, took a bit of time, but in the end it was worth it. Love. I'm in love with this tape. To me it was super easy to use! It didn't stick onto the nail so much that it ripped off the paint base, and it wasn't not sticky enough that it didn't want to stick. My only complaint was that I kept losing the end of the tape!! When you have wet nails, this can be a problem! I decided to pre-cut all my strips of tape before. Actually, I used about 12 little pieces all together. I was lucky to be able to use the same pieces numerous times. Maybe because I was doing a gradient and not as much paint was getting onto the top of the tape? Who knows. In order to alleviate my losing the end of the tape problem, when I was all done with my manicure, I took some scotch tape and folded it around the end of the tape. This way, I will easily be able to find it. I found it nearly impossible to roll over this tape on top of itself, reason I reached for the scotch tape. If you like what you see, and need your own nail art tape, head on over to the Born Pretty Store. Currently, the 12 rolls of nail art striping tape is $1.90 and you get free shipping. If you want them even cheaper, use the code AMBK31 to get 10% off! How can you go wrong! Seriously, if you want quick, easy, and really fun manicures, go get some now! 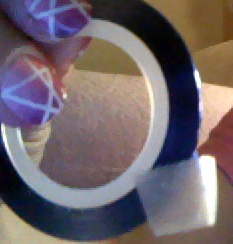 I cannot wait to use my tape some more!!! Wonder what else I'll be able to come up with! Do you like nail art tape? Have your own set? Never used it? Lover of scotch tape manicures? i HATE taping.. i mean, it makes me feel polish-challenged.. tape and water marble are things I hate, from the bottom of my polish-addicted heart..
i guess i just stopped trying, event though i do have some nail art tape. you encouraged me to try again.. LOL.. will tag you on my blog (is not the blog attached to my google's account) if i get to do it. Watermarble is the WORST!!!! Just do not even get me started!!! 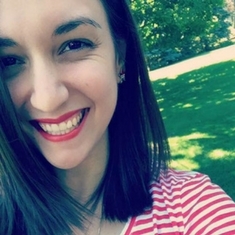 What is your blog!?!? I can't wait to see!